It’s October. While you sip your pumpkin spice latte and cheer on your favorite football team, it’s also time to talk about energy. Happy #EnergyAwarenessMonth! This month, companies and organizations around the country are raising awareness of the importance of energy efficiency. Cox Enterprises is a passionate supporter of alternative energy, leading through investments in innovative, energy-generating technologies. With projects like its New River Clean Energy Facility and more than 40 alternative energy projects across the nation, the company is committed to generating renewable energy to power its operations while often providing power to the communities it serves. This month, Cox released the results of its 2017 Cox Conserves Sustainability Survey, which found that small and medium-sized business owners (SMBs) are also passionate about long-term energy efficiency. 68 percent of SMBs use energy-efficient lighting systems and equipment in their companies. 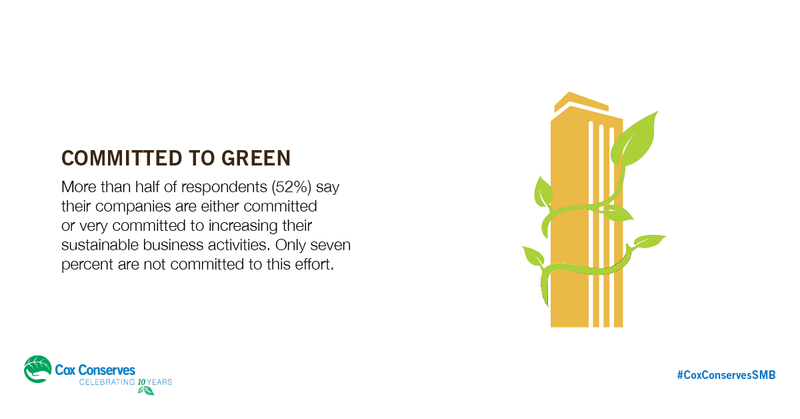 More than half of SMBs (52 percent) say their companies are committed or VERY committed to sustainable business activities. 57 percent of SMBs say utility cost savings for energy and water is the biggest benefit of implementing sustainability initiatives. Turn off computers and other office equipment when they are not in use. Turn off the lights every time you leave your office. Lower your heater thermostat to the lowest comfortable setting when your business is occupied. Set the temperature back further when the business is unoccupied. Talk to your building manager about incorporating recycling programs, as well as energy and water-efficient appliances. Read more highlights from the Cox Conserves Sustainability Survey and visit www.CoxCSRReport.com to learn more about the company’s sustainability initiatives.